This week we talk directly with Rebekah (Becky). She discusses the origins of the self-portrait and really wows me with advice I think all women with alopecia can learn from no matter your age. 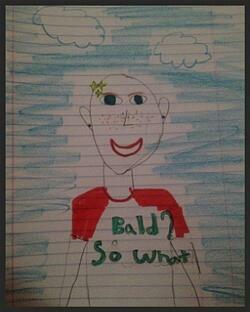 Thea: I just love the self-portrait you made in a Bald? So What!® t-shirt. It is extra special because this is the very first time anyone has ever made a self-portrait in our shirt. Thank you! I’m the only person in my family to have alopecia areata. I had very long thick hair, so it was a big surprise when I lost it. Is there anyone else in your family with this condition? Rebekah: I am the only one who has alopecia areata. I only met one other person who has alopecia. We saw her at the grocery store. Her name was Lisa. She was pretty. Thea: How did you find the t-shirt you are wearing in your self-portrait? It's perfect for alopecia awareness month. Rebekah: My Uncle Joe found your website and surprised me with the Bald? So What! t-shirt. I was very happy to find a shirt that recognized my condition. Thea: What words come to mind about how it made you feel? Rebekah: I did want my friends to see the shirt. I wanted to show them all. No words came to mind but I was very excited. It inspired me to draw the picture. Thea: To me the portrait is very happy. I see a beautiful girl with a beautiful smile. I see a girl who loves herself and it makes no difference that she has no hair. Tell me about the yellow flower in your portrait. Rebekah: It’s not a flower, it’s a sparkle the sun makes when it reflects off my head. Thea: You have a keen eye for detail. Do you have a favorite color or favorite accessory for your head or elsewhere? Rebekah: I have 3 favorites. I love my sparkly purple beret, my pink cowgirl hat that has a tiara sewn to it, and a hat that has kitty ears, big kitty eyes and nose. 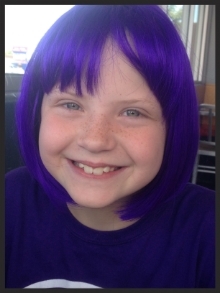 Thea: Do you have a special friend who was the first person you told about your alopecia? Rebekah: My friend Elizabeth was the first person outside of my family that I told. Our moms were friends before we were born. Thea: How did you tell her? Rebekah: My mom told her mom. No one really noticed a lot before school got out that my hair was falling out. I had a basketball game the day we shaved it. I was wearing my purple bandana and I took it off to show her. I started playing basketball and swimming bald. Lots of people have seen my bald head. Thea: If you were giving advice to another girl your age who is also new to alopecia, how would you tell her to handle it? Rebekah: First have fun with it, don’t be afraid to go out walking bald. Buy winter hats because you would be surprised how cold your head will be without hair on it. If people are wondering why you have a hat, just show them. If they make fun of you, they are not really your friends. Thea: Did you tell your classmates all at once or one at a time? Rebekah: Well, school is just starting. My oldest sister is helping me make a video to show all my classmates at once. Thea: Did your friends ask a lot of questions? Can you remember what they wanted to know? 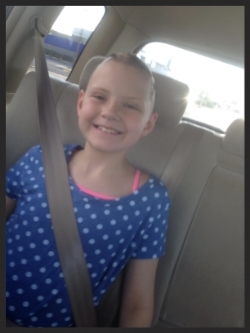 Thea: Do you think some things this year will be easier or harder because of alopecia? Rebekah: If the kids have problems with it they don’t have to sit with me. My best friend Elizabeth is in my class so I know I won’t always be alone. 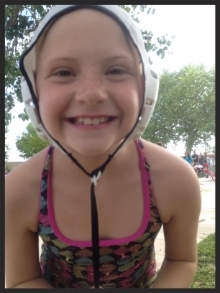 Thea: Do you have a favorite hobby or sport? Rebekah: I like to draw, I swim, play water polo, and basketball. This year I am going to try tap dance and ballet. Thank you to Jenean, Rebekah and their whole family for sharing such an inspiring and positive story. Share your words of enouragement with Rebekah in the comments!